Place dessert shells on parchment- or foil-lined baking sheet. Form ice cream into 6 half-cup scoops. Place one scoop on top of each dessert shell; freeze 4 hours to overnight or until ice cream is very firm. In blender, purée mango with 1/4 cup sugar until smooth. Just before serving, heat oven to 500°F. With electric mixer, whisk egg whites until soft peaks form. With mixer running, slowly add 1 1/4 cups sugar; continue to beat until stiff peaks form. 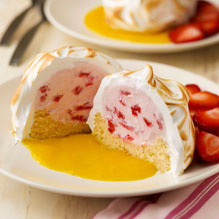 With spatula, cover ice cream completely with egg whites, leaving dessert shell exposed. With spoon, form peaks in egg whites. Place in oven 2-3 minutes or just until tips of egg whites are browned. Spoon 2 tablespoons mango purée onto each of 6 dessert plates; place 1 Baked California on each plate and garnish with strawberries. Serve immediately.